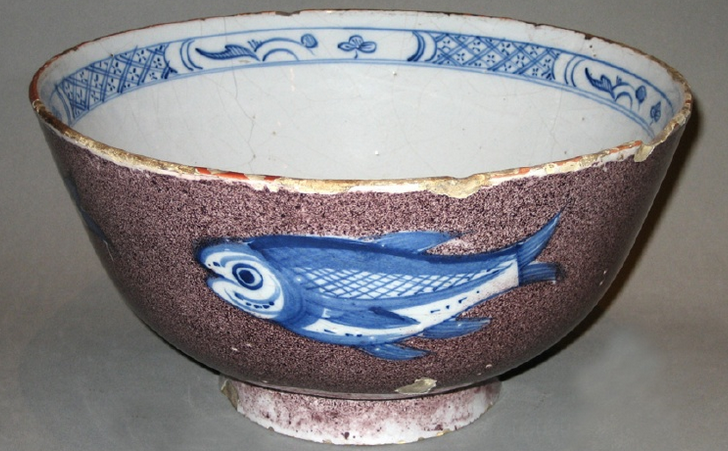 Some punch bowls are decorated with fish swimming around the exterior of the bowl, as in this Bristol ware punch bowl from 1730-60, with manganese purple exterior and blue and white fish. 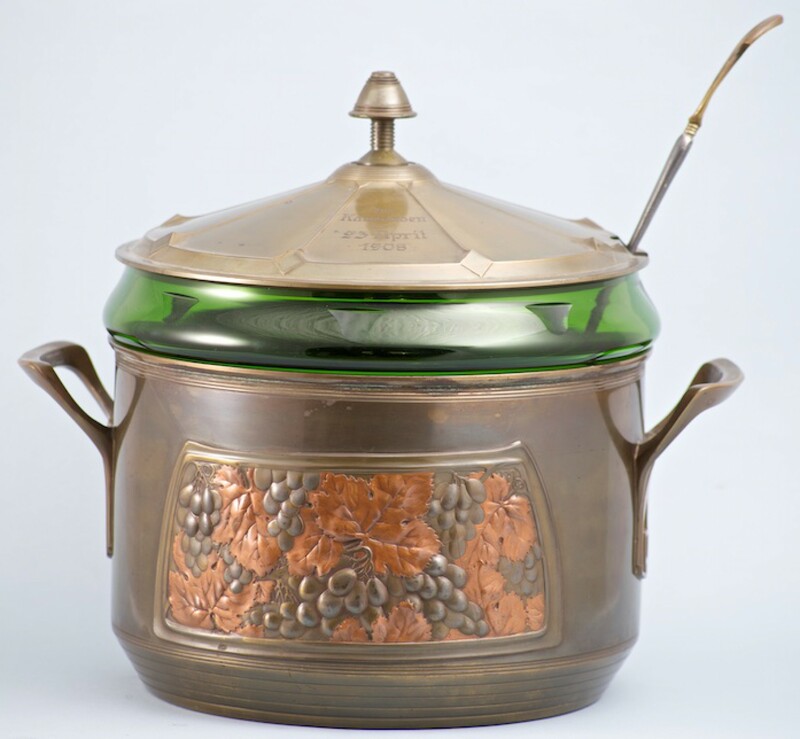 The nest of punch bowls (below) allowed for serving different quantities of punch. Made in London or Bristol, England; 1740–50. 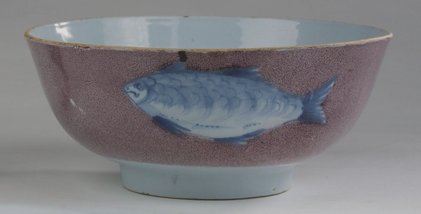 Some bowls feature fish on the inside. A London delftware punch bowl c.1765 (left and below) , has a plain manganese outside with four fish swimming round the bowl on the inside. Their fins would show just above the level of the punch when the bowl was full, giving the impression that they are swimming in the punch. 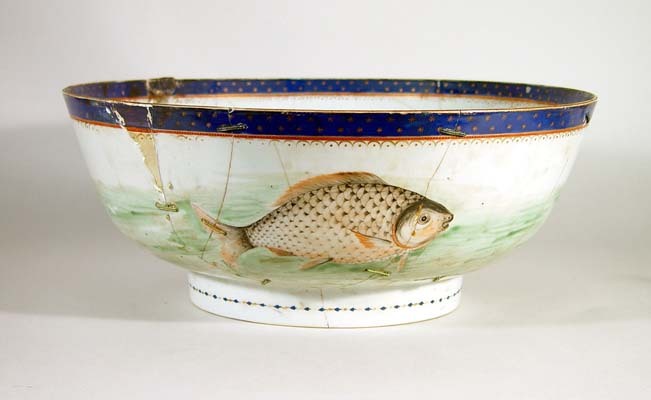 This Lambethware punch bowl from circa 1770-80 has more stylised fish flowing around the bowl both inside and out, with the same plain manganese background on the exterior. Punch bowls sometimes featured quotes or poems, often inside, on the bottom, to be revealed when the punch was fully drunk. 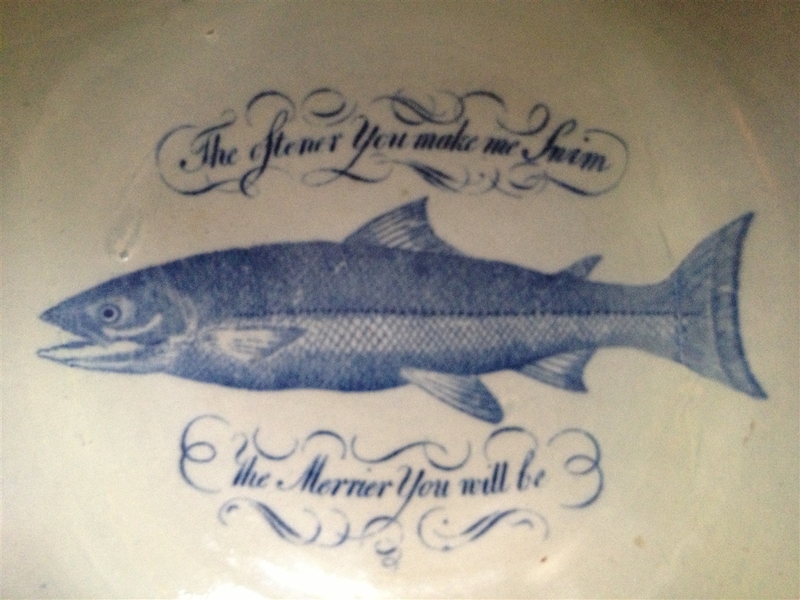 This pearlware punch bowl from 1785-95 has the motto ‘The oftener you make me swim, the merrier you will be’ around the realistic picture of a fish, on the inner base of the punch bowl – a poetical reference to the illusion of the fish swimming in the bowl of punch. The decoration on this Chinese porcelain punch bowl may be there for a different reason. In China the fish, or yu, is a homophone for wealth and abundance. Fish suggest connubial bliss because they live in complete harmony with their watery surroundings. This William de Morgan punch bowl circa 1870 is richly decorated with fish, using the bright turquoise and blue colours and oriental design favoured by de Morgan. Fish are still linked with drinking. 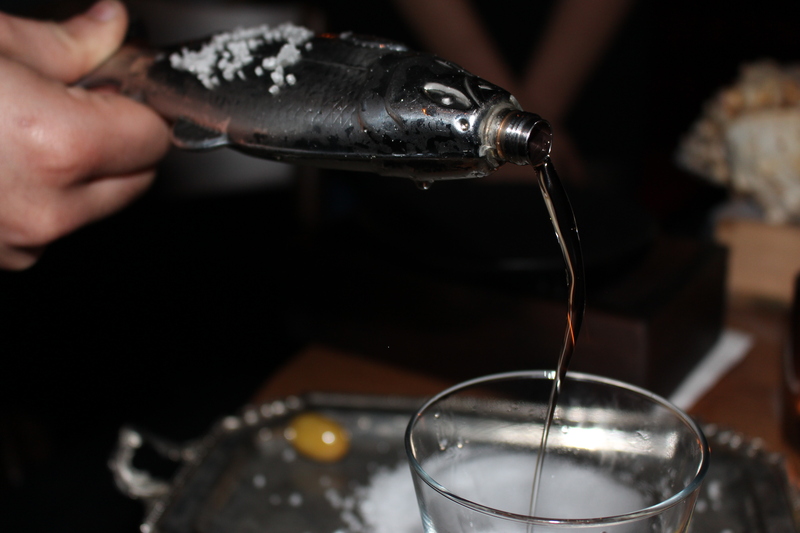 The imagery of the drunken fish is continued with this metal fish flask at The Bell Boy Bar, Tel Aviv, brought to the table on a bed of rock salt, to keep it chilled, and filled with an ultra-dry martini cocktail. The salt can be eaten with the drink. 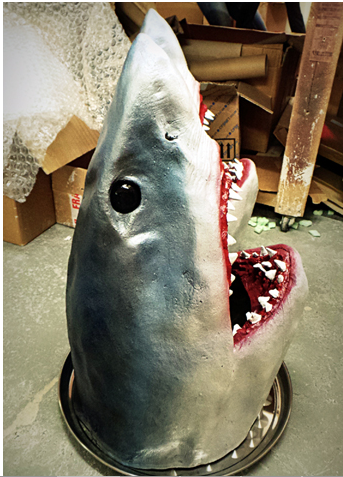 Contemporary bowl in the form of a giant shark’s head, for cocktail sharing, made by Bespoke Barware for the Steam and Rye Cocktail Bar in the City of London. 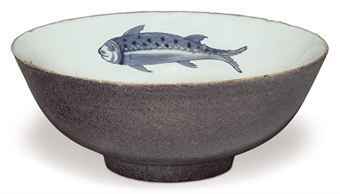 This bowl is more for the theatrical and spectacular impression than any reference to drinking like a fish. Putting your head in a shark’s mouth to drink has a certain thrill! ← French Governor – A new Classic Cocktail?